The MeasuPro Digital Cooking thermometer will imbue you with the utmost confidence to create the perfect dishes. It is designed to make food preparations simple. Peeking into the oven to check the doneness of the food you are cooking or baking is inconvenient and causes the oven temperature to lower drastically. With the MeasuPro Digital Cooking Thermometer there is no need for that. You can set the thermometer to the temperature of your choice. Stick the long 36 inch probe into the center of the food and close the oven door. The thermometer will beep once the food hits your desired temperature. Its built in timer is a great feature while you are working in the kitchen. The thermometer probe's cable diameter is small enough to allow it to be closed in an oven door without creating a heat leak. It has and extra wide measuring range of 32°F to 392°F. MeasuPro is intent on reducing worries... and flopped dinners! This digital cooking thermometer works great! It's very handy, easy to clean and super easy to use. I simply leave the probe in the meat I'm cooking, then leave the unit outside the oven. It was long enough to reach and there is a magnet on the back, making it easy to place right onto my oven. And, just as you would set your temperature on your oven, I love that this thermometer allows you to program or pre-set the temperature you desire and then alerts you when it has reached it. It really takes the guessing game out of cooking. I was also able to choose Celsius or Fahrenheit. I love that the temperature is very visible and easy to read, so I always knew what the temperature of my food was. If you are in the market for a new digital thermometer, I would gladly recommend this one. 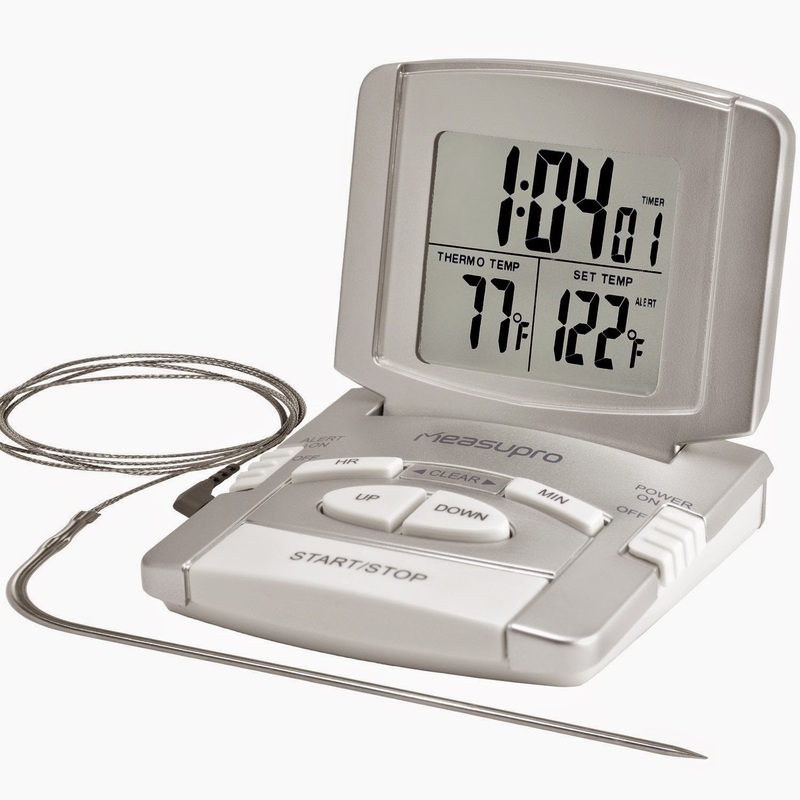 Whether you're a novice or professional cook, this thermometer would make a great addition to anyone's kitchen. If you would like to try it out for yourself, you can purchase the MeasuPro DCT250 Ultra-Fast Instant Read Digital Cooking Thermometer with Timer right now from Amazon!